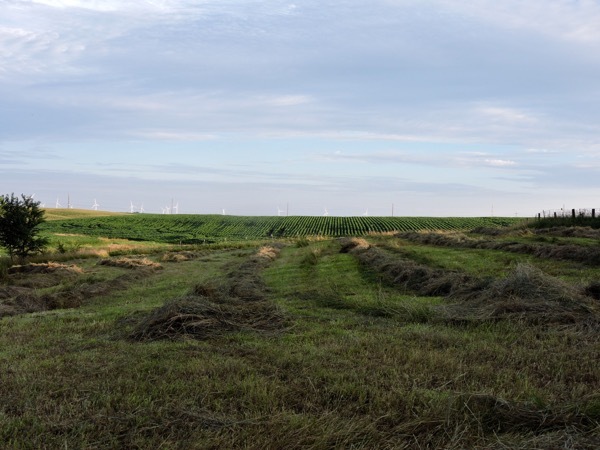 Very few things beat the scent of a freshly-cut hayfield. 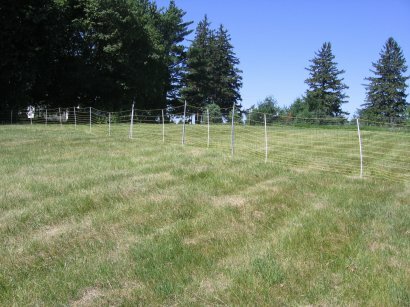 The neighbor took a cutting off the back pasture as we don’t have enough animals to keep it mowed down this summer. It is rather novel to be able to walk anywhere in the pasture again. February 15, 2013 – Sometimes a Candle isn’t Enough! 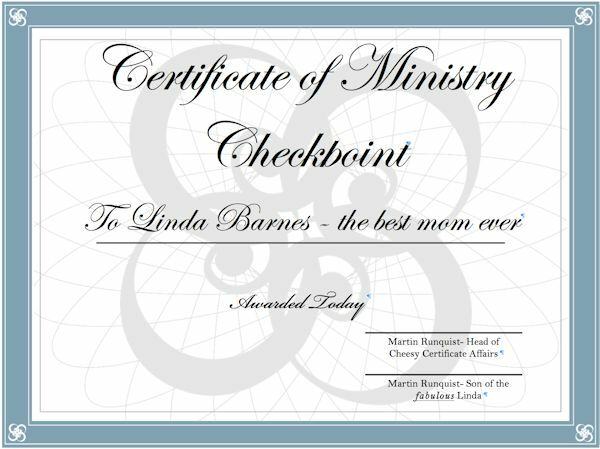 Today was a milestone day in Linda’s seminary studies. Our denomination has a “weed-out” point where a committee can say 1) you cannot be a minister, 2) go ahead in your studies, or 3) go ahead, but work on these things and check back with us at a later date. The interview was in San Francisco, and the committee looked at the results of her 2.5 day psychiatric evaluation, references, and course work. It was similar in feel to a prelim for a Ph.D. candidate. Many of her friends and colleagues told her they’d be thinking of her and lighting a candle for her during her interview. Of course, I have a much bigger stake in her success than her friends and colleagues, so I decided, a candle would not do for me. My best option was to have a really big fire instead of a candle. 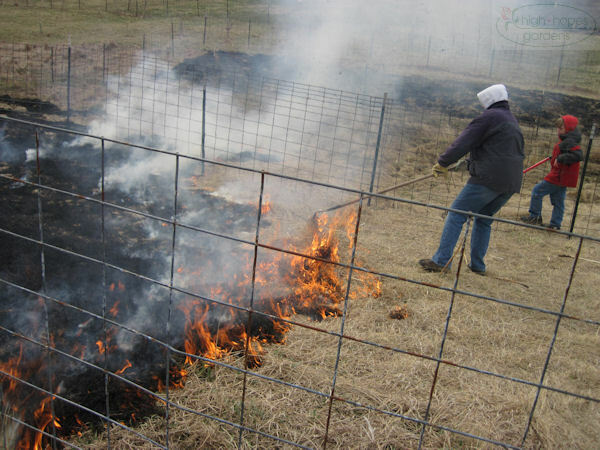 So, it was time to light the back pasture on fire! 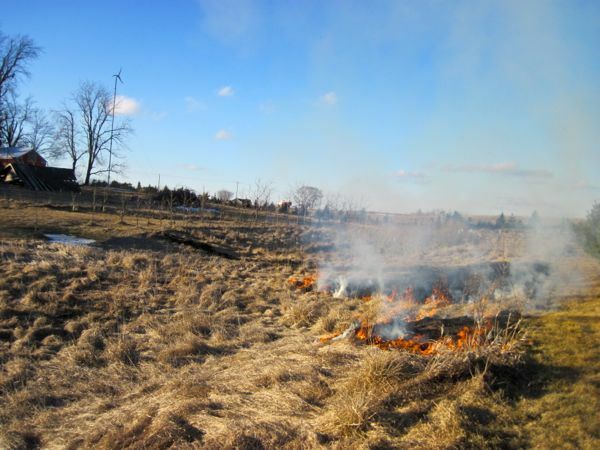 This area hadn’t been grazed for about 4 years, so it was full of dead grasses, waiting to have their nutrients returned to the soil. 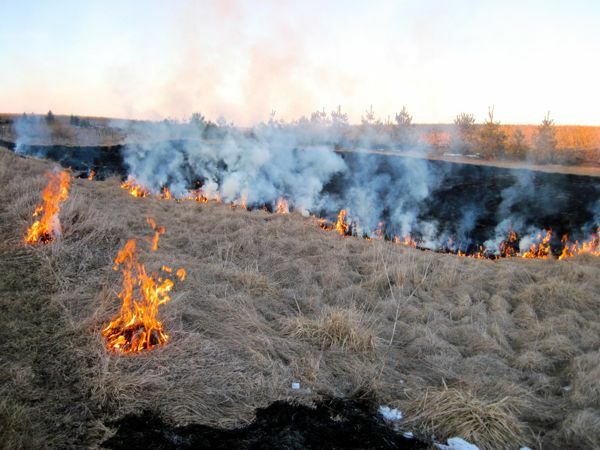 There was still some snow along the fencelines, I had perimeter firebreaks burnt, and always burned against the wind, so the fire didn’t move too fast. Kids, don’t try this at home – I am a professional and used to get paid to do this in a former life. The resulting perfect rectangular burn. This certificate that Martin made for Linda shows that the result for Linda was positive. I’ve been fighting thistles for years in the pasture, it seems. Many years ago, when we rented the pasture for cattle grazing, a big round bale that was brought it left its mark the next year by sprouting a patch of thistles. I’ve tried periodic mowing to knock them back, but since they tiller well and have big roots, it’s hard to get rid of them. 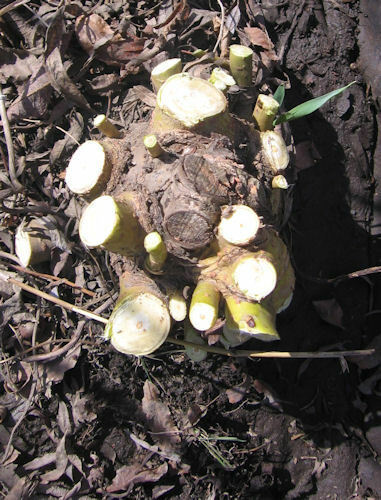 Evidently, the best way to get rid of them (as in most effective, not most fun) is to pull them by hand when they are just about to bloom, as the roots have given most of their energy to the flowering and are at their weakest ebb of the season. So, all five of us donned leather gloves and systematically walked though 1/3 of the pasture and yanked them all. My hope is, we will have to do this only one more time when the grow back again to weaken them enough to say uncle and find some other place to live. 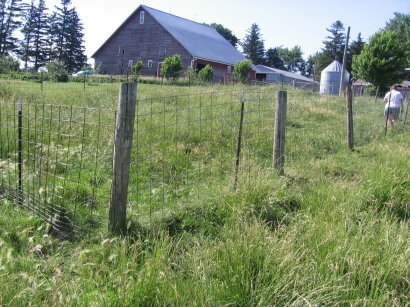 Like good fences, no blooming patches of thistles makes good neighbors! 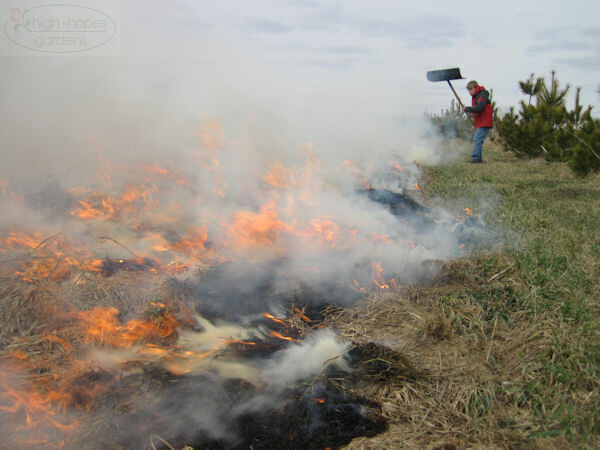 March 26, 2011 – Burn, Baby Burn! 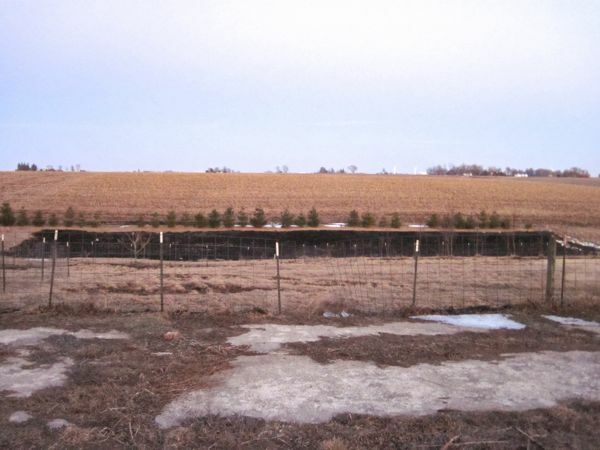 Because of the row of new trees down the center of the back pasture, the area from the trees to the back property line hasn’t been grazed for a bout 5 years. 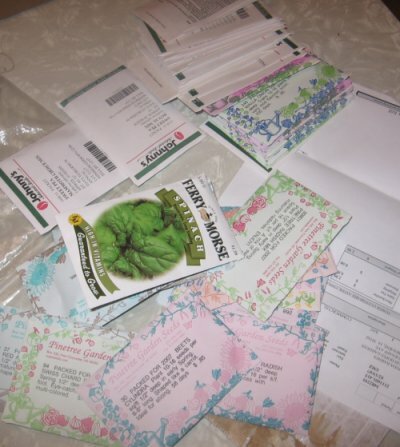 I was time to reduce some of the biomass to let this year’s plants sprout. Martin ready with some buckets of water, backpack sprayer, and shovels to snuff out fires. Here, Linda spreads the backfire, moving the fire against the wind. Once the backfires were lit, we could let the wind take the fire to the backfires. Martin and Linda on patrol to make sure the fire doesn’t creep upwind to the pine trees. 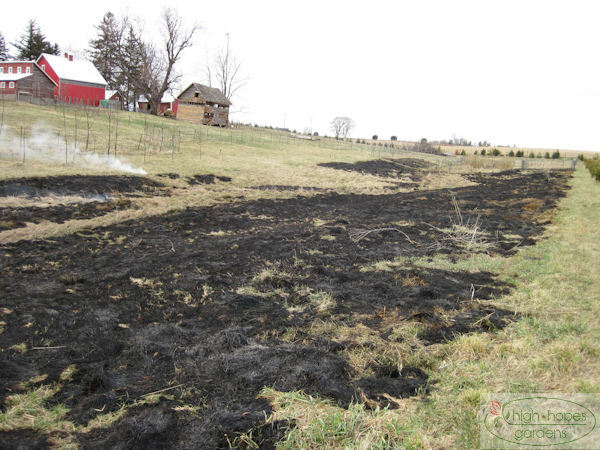 The mowed path nest to the trees does the most to stop the flames. The final result. It’s great to have an excuse to play with fire. 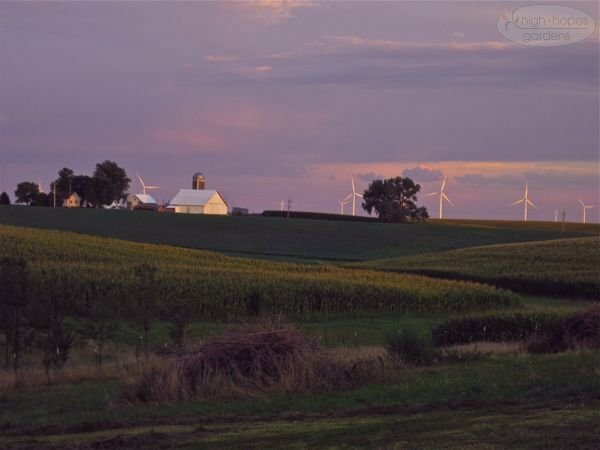 Nothing is really simple around the farm. Last year’s septic installation, for example. There’s no way getting around a lot of torn up ground. 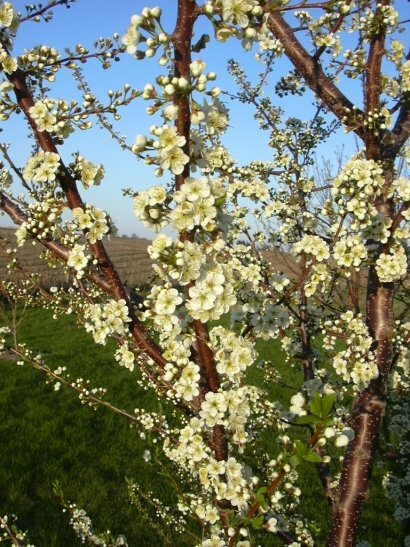 Now that the piles have had a chance to settle over a fall, winter, and spring, it’s time to re-establish desirable vegetation. This shows a view below the tanks and the house in the background (the drain field behind us). 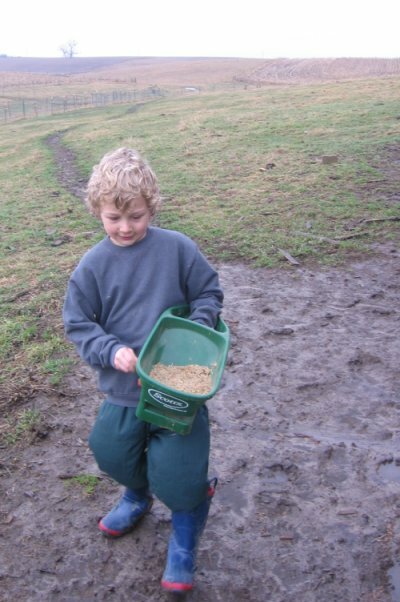 Last week I seeded the path up to the pasture in regular lawn grass and lightly covered it with straw – the pasture part in this photo, I bought some grass and legume seeds. 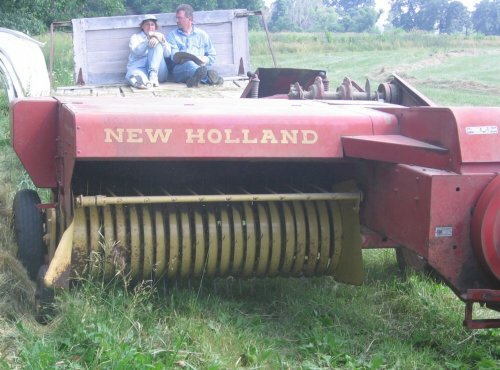 Getting the seeds is the easy part – first, I needed to get out the old disc we bought with the farmall cub. It had sat for maybe five years – finally got it extricated from it’s last resting place, then disced up the area, spread the seeds, raked over them, then retrieved the electric netting and solar charger to keep the chickens out, who would find the grass a legume seeds a treat to dig out of the ground. Now all it has to do is rain every few days until the seed gets established. You may also notice a new watermark on the photos. I’ve discovered that blog photos have a life of their own on the internet. Many times people have asked me to use a photo and I’ve always granted permission. So I’m going to start putting the high hopes logo watermark on them, so if they do reappear, they will at least have a visual link back to the source without the authors having to necessarily interrupt their text with an acknowledgement. It’s time for some soil sampling. 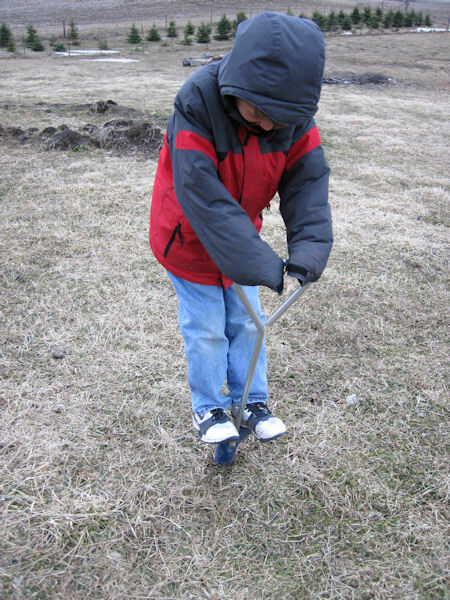 Instead of the small little soil probe that comes with the kit, we decided to use the bulb planter, so we could easily get below the sod line for the pasture soil test. 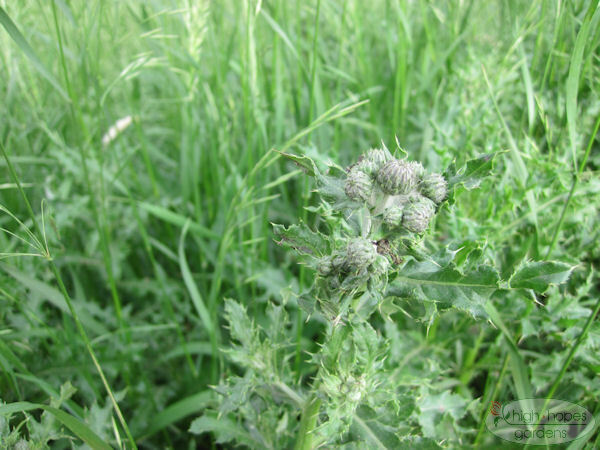 This particular section of pasture has a thistle problem and I’ve read anecdotal evidence that calcium and ph can be conducive or not to thistle success. So, off we go getting some samples. 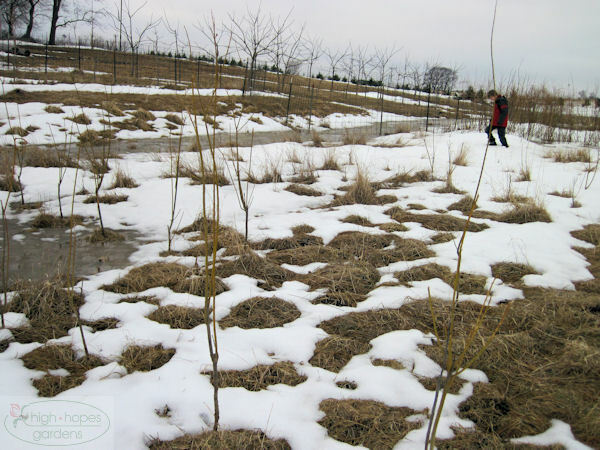 It’s time to cut back the willows in the willow nursery. 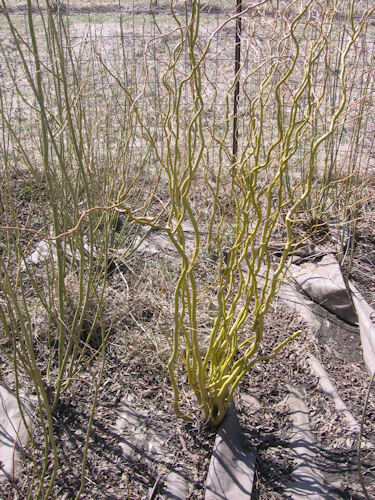 Here’s a curly willow before pruning. 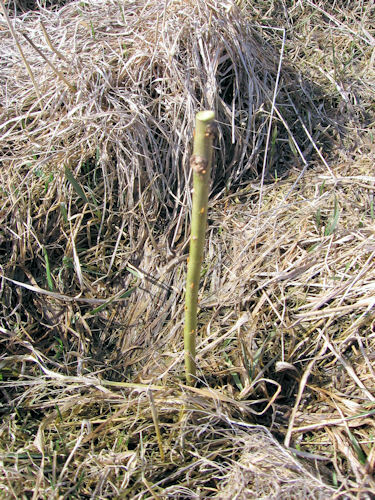 I use the prunings to start more willows. I put 88 in the ground. 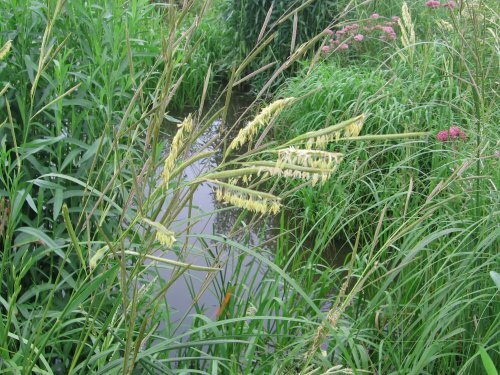 They seem to grow by just sticking them into the ground – we experimented last year just sticking them in a low spot and they survived without weeding, or even mowing. So, I will move the patch down the lowland. If nothing else, the goats will love the browse. I’m a little bit pumped about our willow nursery. 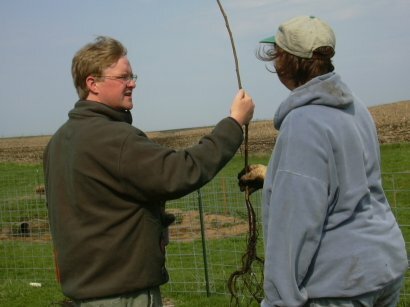 It’s taken off and I am even more excited to try expanding the willows as browse for the goats and sheep. 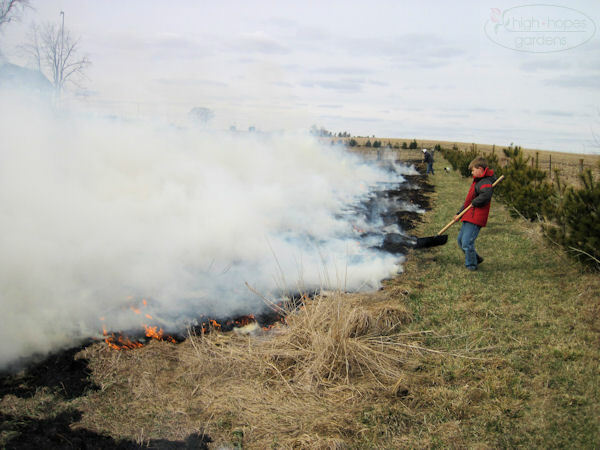 As soon as the ground unfreezes, we’ll cut these down and plant many more in the back pasture. 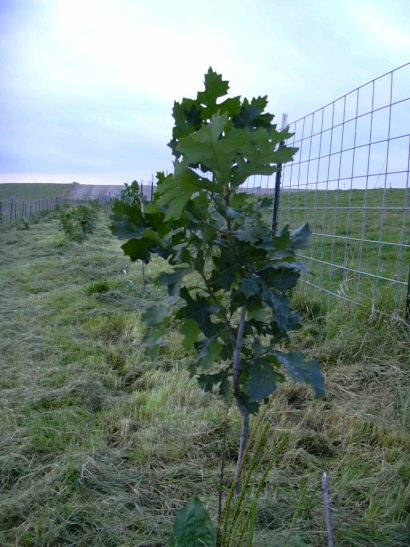 The test plantings we did last year, just into deep pasture grasses survived year one, and the willows offer great food for the animals, so we’ll try doing more this spring. 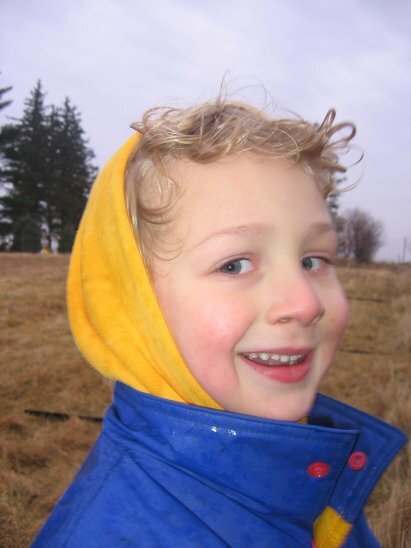 I thought a seven-year-old boy would appreciate the life in the wetland, so I made it a point to bring Martin over and wax on enthusiastically about the tadpoles and diversity of life in the small exclosure when we were working on the trees in the back pasture. 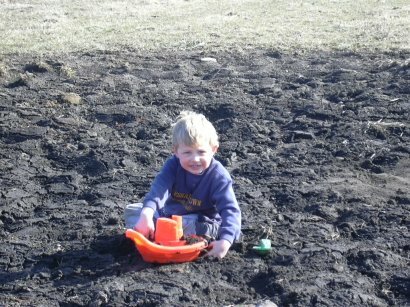 A bit later, he was helping mulch some trees and ran out of things to do, so he asked if he could go look at the swamp, as he refers to it. I watched from a distance as he first climbed part way up the fence, peering in. I made a bet with myself that it wouldn’t be long before he crawled over the fence and went inside to look. 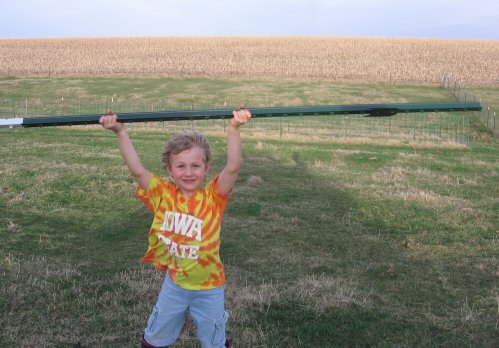 Sure enough, the pull was too strong and he crawled over the fence. A few minutes later he came running at full speed towards me, face red with heat in the 90 degree day “Dad, there’s a turtle in the swamp!”Â He shaped his hands about as big as a dinner plate and retold the story of the turtle siting. As I went back to see if I could spy the turtle he turned to me and said “Dad, the farm is getting a lot bigger now.”Â I asked him what he meant and he said “Now we have a swamp, we have a baby forest, and a wind turbine.”Â Even though you can’t buy that comment with MasterCard, I still thought it was priceless. We started an experiment a few years ago. 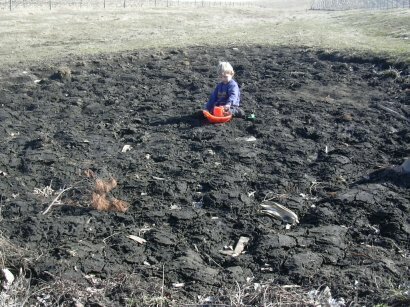 There was this awful mudhole in the pasture that seemed to get bigger by the day – when the grass was soggy, the cows would keep breaking hunks of sod off, enlarging the mud area. This is what it looked like in the spring of 2005. Martin can’t float his boat. I got the idea for fencing this area off from the summer camp I worked at in northern Minnesota. 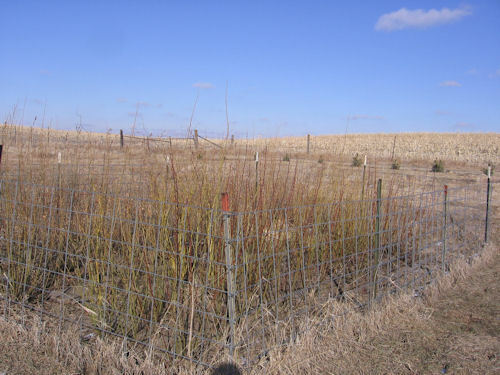 NaturalistÂ and nature photographer Les Blacklock suggested that an area near the center of camp be fenced off from regular foot traffic and be called the “exclosure.”Â The idea was that a different group of plants might grow up just by leaving it alone. As no part of the farm is left undisturbed, I thought this small section could be spared. 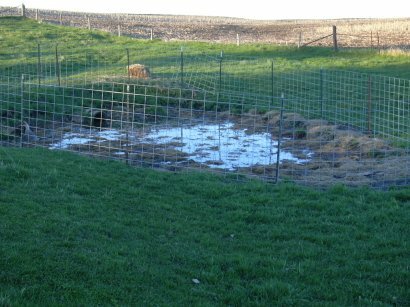 So this mudhole was fenced off, I ordered some marsh and wet (mesic) prairie seeds from Ion Exchange and waited. The area is hard to manage as it gets runoff from the surrounding crop fields and a few times a year water rushed through like a small rapid stream, but most of the time it is dry or muddy. I thought if I could establish a canopy of marsh plants, the water might stick around longer in the shade of the plants. 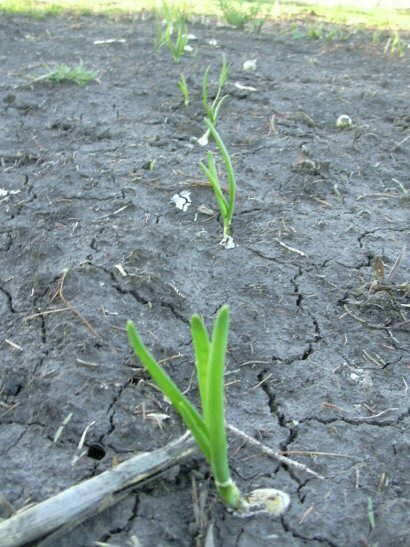 Here’s a peek at one of the plants to pioneer along the edge of the mudhole – Prairie Cordgrass. It’s been a wet year (5 more inches of rain this week) and the exclosure has had continuous water since snowmelt. 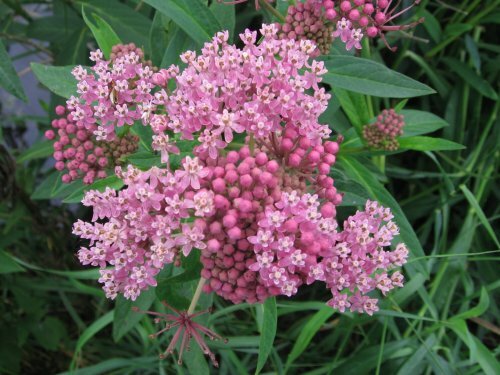 Butterfly milkweed has also been successful in addition to many other plants. It is full of tadpoles, different kinds of dragonflies and butterflies, and many other things I’m sure I don’t see. 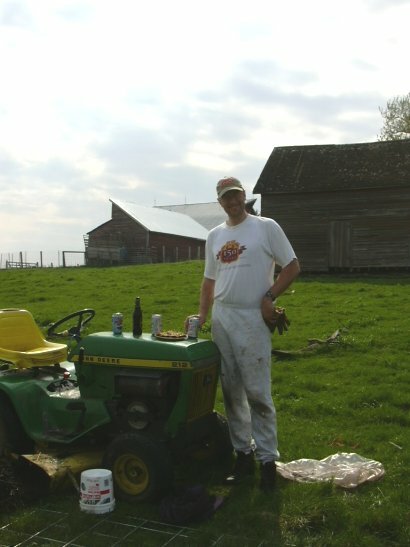 There’s always something to do on the farm, but eventually the most urgent things spring to the top of the list. One of these items is this fence. We’ll call it the “Leaning Fence of Melbourne.” It’s a bit of a pain to tear out the old, but this one is way past its prime. 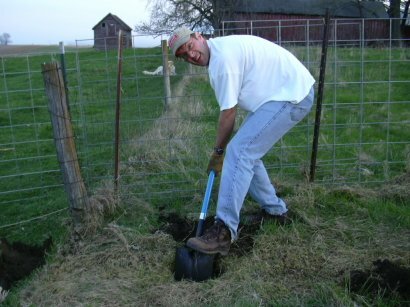 Tearing out woven wire fence involves pulling out fencing staples from old posts, pulling the old posts out of the ground and ripping the old wire away. 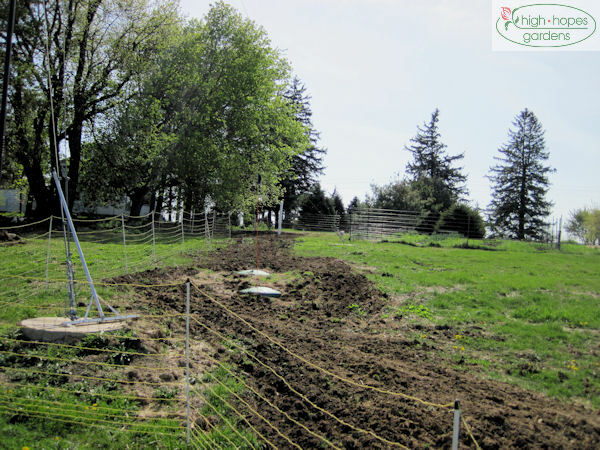 The wire is usually the hardest part as commonly there is of soil and grass above the bottom wire of the fence that makes is hard to pull up. 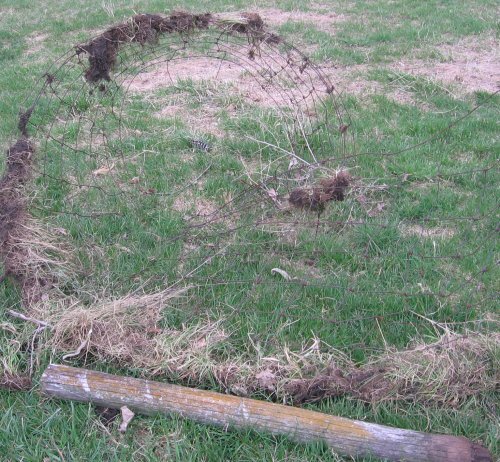 Here’s some detritus from the old fencing – the salvageable woven wire will be turned into tomato cages, the rest to the recycling at the landfill. A section of new fence, standing tall and proud. After another rainy week, it’s important to keep moving ahead, even though the saturated ground prevents us from getting the new trees and grapes in the ground. 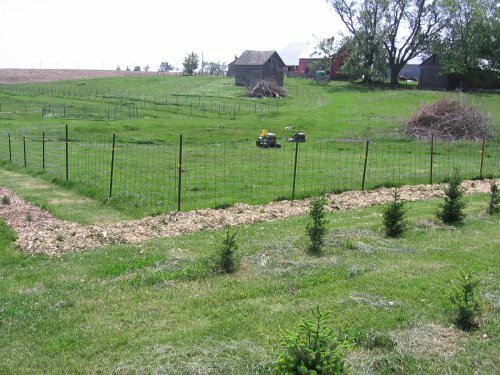 So today, we moved a fence to enlarge an exclosure in the pasture to accommodate the trees, even though we can’t plant them yet. 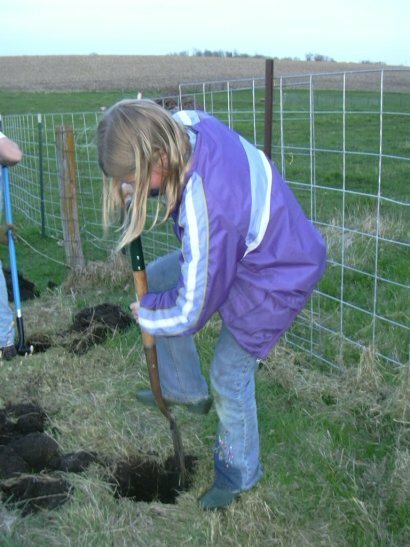 With saturated ground, it was easy to pull and set the fence posts. It was foggy and drizzly in the morning, but stayed relatively dry in the afternoon. 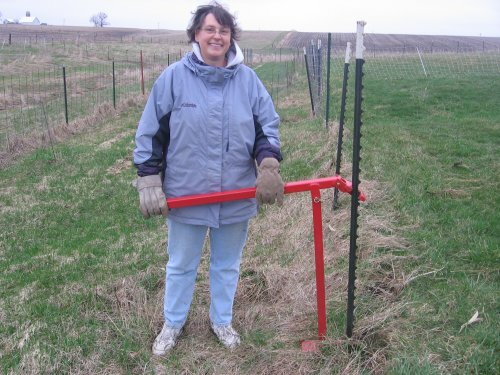 Linda’s working with the post puller. This is one of my favorite pieces of equipment – it’s easy to use, virtually indestructible, and hard to lose! 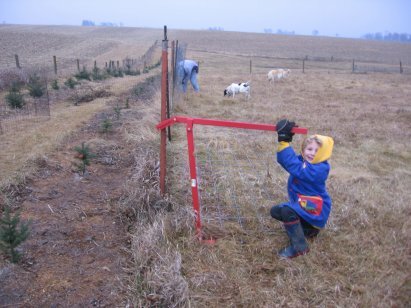 Since we don’t have much land to play with, we’ve opted to use cattle panels for much of the interior flexible fencing. 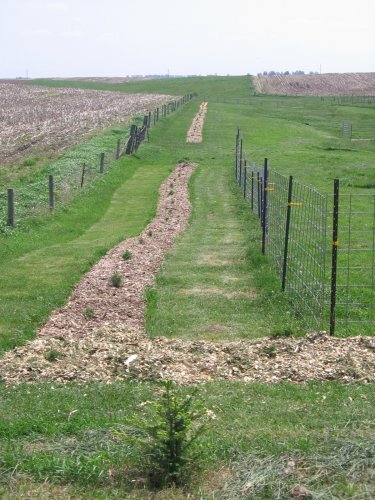 We like the ease of installation and don’t have a lot of permanent fences, except the property boundaries, so even though it is more expensive initially, we never bought too much at a time, so the extra expense is worth it to us in ease of installation and flexibility. Last year I frost seeded some clovers in the back pasture (frost seeding is a fancy name for just throwing seeds on the ground and the early spring freeze/thaw/rain snow moves the seeds down into cracks in the soil and puts them in a place to germinate). 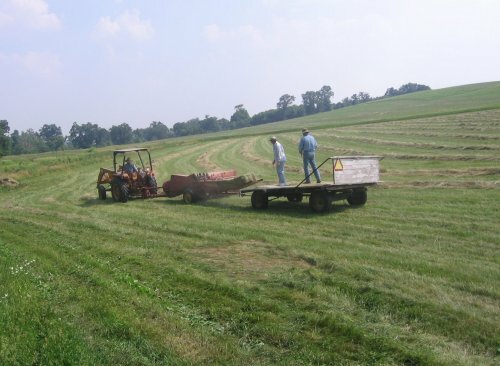 The pasture was greatly improved from its grass-heavy state. So this year I’m doing a couple more types of clovers and some birdsfoot trefoil. 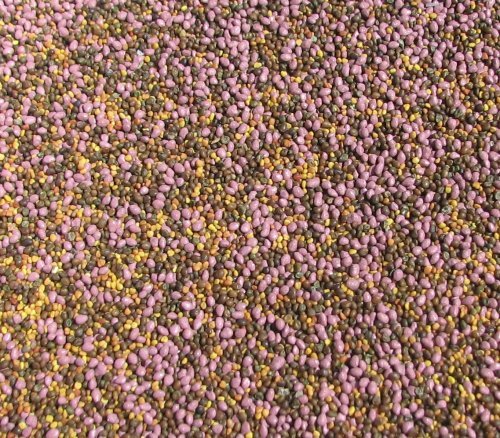 The seed mixtures are so very colorful. On Sunday, the temps soared to 46 degrees! 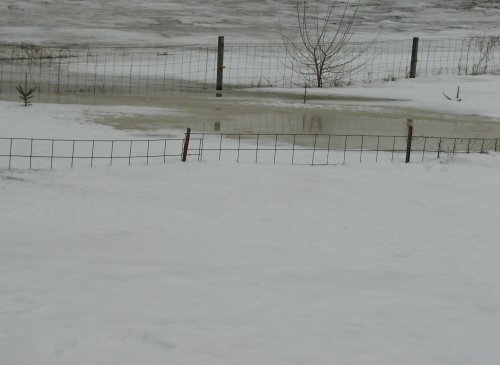 In the back pasture, the four foot high fence is nearly buried and the yellow snow is water flowing through the snow from a drainage in the adjacent field. We’ve got a lot of melting before spring comes. A temporary river started flowing through a low spot in the back pasture. It was strange to see and hear the sound of running water. 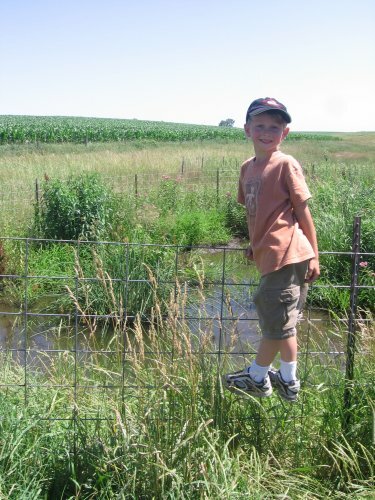 Here Martin is walking on a fence over the flowing water. 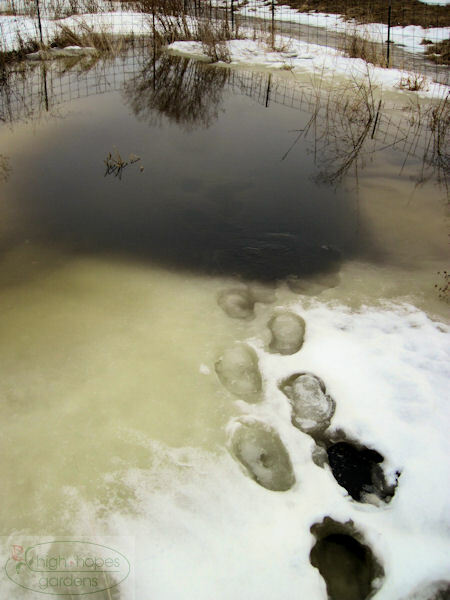 This time of year the snowpack can be deceptive as the top of the snow can look white and normal, but if you step in, it could be a couple of feet of slushy flowing water just below the surface. 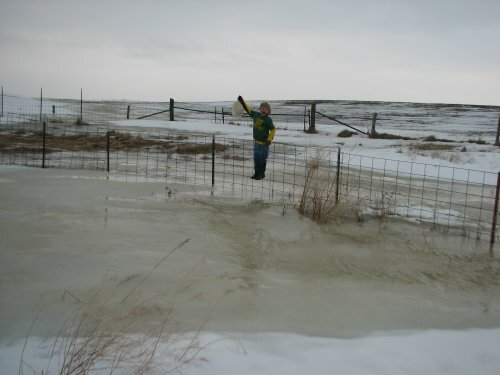 These are fun days for the kids – to run around in conditions that often don’t happen – like water flowing through big drifts where where is usually not any water. 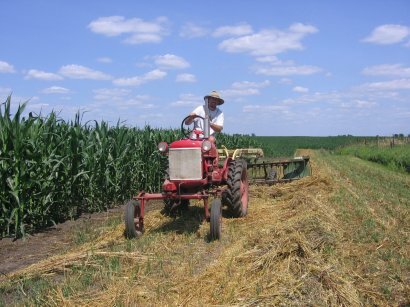 June 15, 2007 – It’s Hot, Must be Haymaking Time! 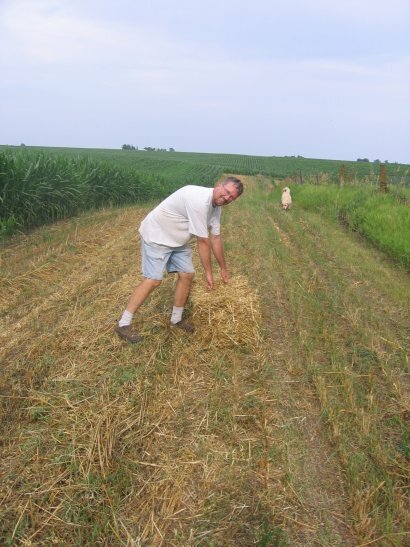 Now that the temps are in the 90’s – that means just one thing – it must be time to make hay! We were invited to help at Two Friends Farm this weekend. How’s this for a date?Â Sitting on an empty hay rack after the unloading 100 or so bales is a good rest. Starting out a new rack after one was under our belts. Even Emma and Claire were enthused about helping and took their turns on top of the racks. 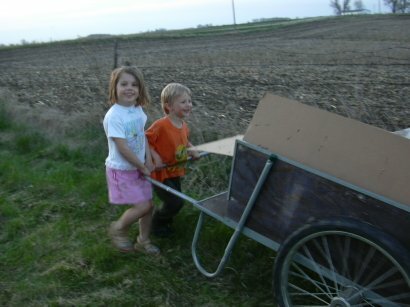 It’s great to now have kids old enough to handle a bale of hay. We figured we handled about 8 1/2 tons this afternoon. Here’s a picture of our new portable electric fence. 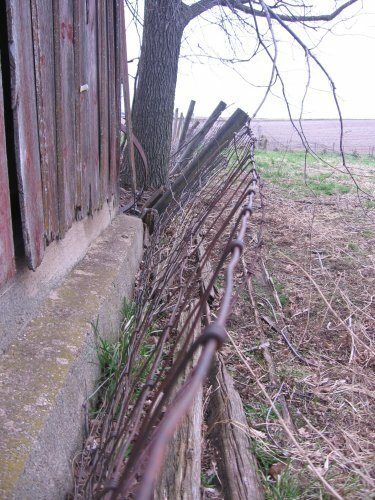 The name of this fencing is “Permanet” as it is designed to be left up for the whole season, if necessary. 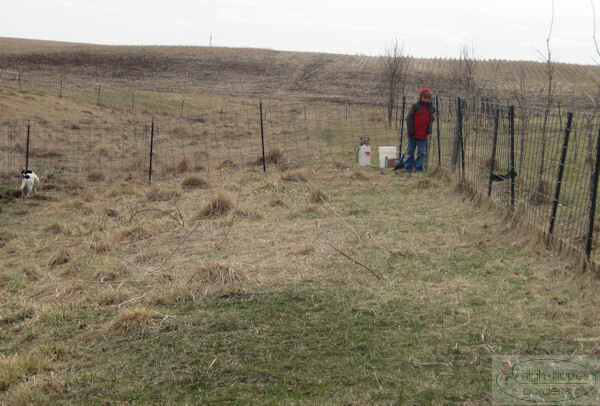 We get our electric fencing from Premier Fencing in Washington, Iowa. Many people swear it is the best you can get. 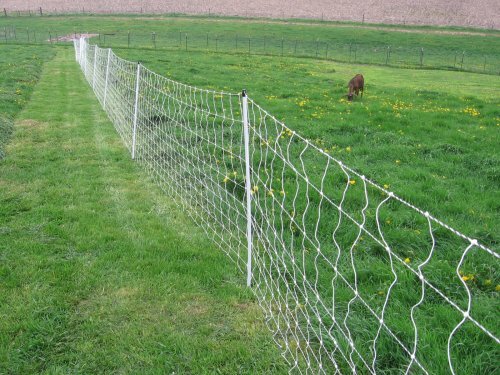 We’ve used some of the poultry electric netting and been pleased with it, so when we found this version that is taller and firmer, we thought we’d use it to start some rudimentary rotational grazing in the back pasture. 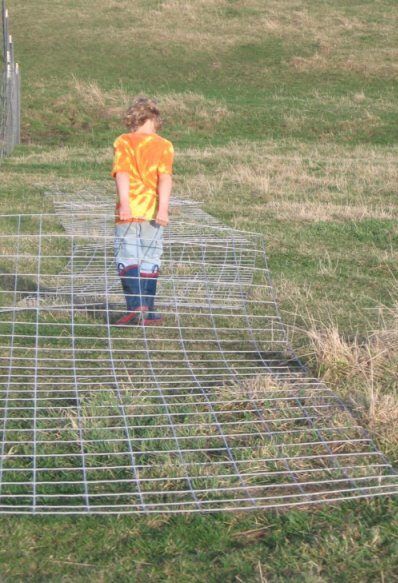 This picture cracks me up – it shows that forbidden grass is always better than grass you’re allowed to eat. 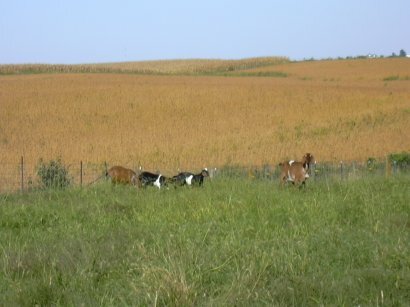 The goats were just turned loose into this pasture that goes all the way to the fence in the distance over the goat’s back. Where do they choose to eat first? 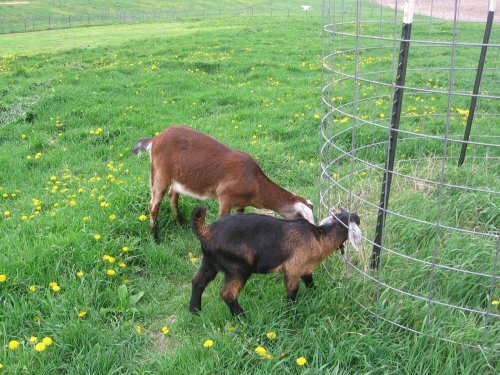 They stick their heads through a fence guarding a tree to get at the “good” grass. 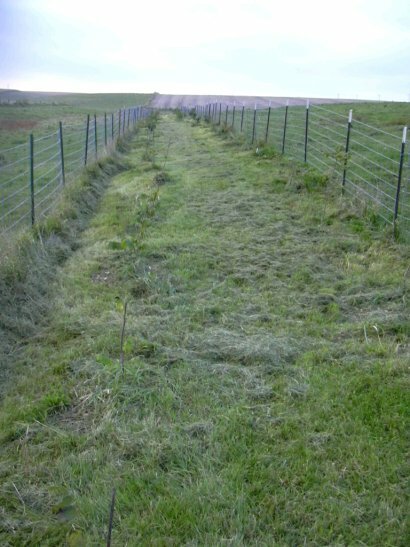 The boundary fence was completed in short order. “All” that is left boundary fence-wise is to re-string the electric wire around the perimeter and this new line. 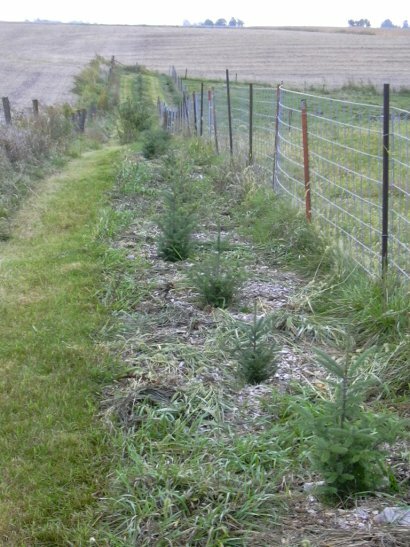 Eventually, if the planting goes as planned, a new fenceline along the east edge will be in order as well. But that is a much bigger project. Another nice June-like day in the upper 70’s. Started working on some more fencing (it will never end). Went to town to pick up wholesale buying club order, got some cardboard sheets and more cattle panels and T-posts. Martin is a great 5 year-old worker. Sometimes he asks what work we can do outside. 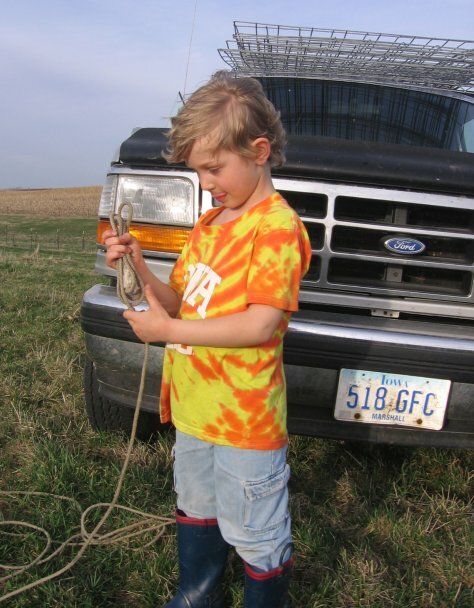 Here he wraps up the rope that held the panels down on top of the truck. It’s a pain to load/unload them from on top of the truck, but I don’t have a trailer that approaches 16 ft and the truck does, so up they go. 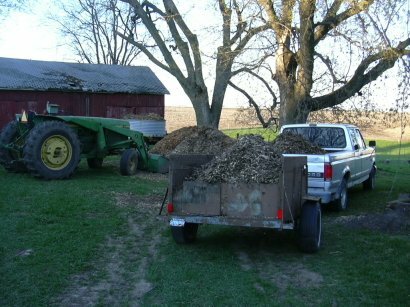 The truck has now graduated into the heavy-duty farm use where scratches and dents only add to the value. Martin was able to drag the panels into position (as long as the location was downhill). 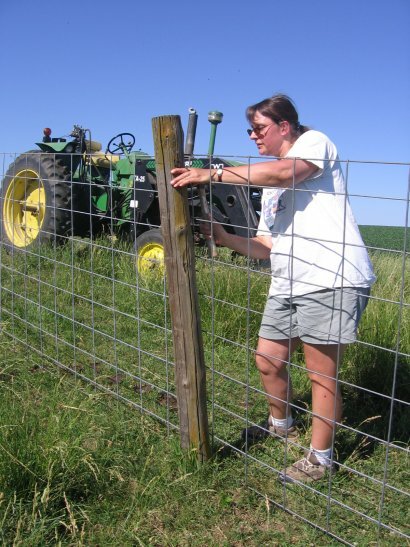 He also was good at distributing the fenceposts – he moved about 75% of the posts to the correct places along the fenceline. All I had to do was get the panels off the truck, drag the uphill panels, and take the binders off the posts that banded them in groups of five and Martin did the rest. The fence is in position, we just need to pound the posts and put up the panels. 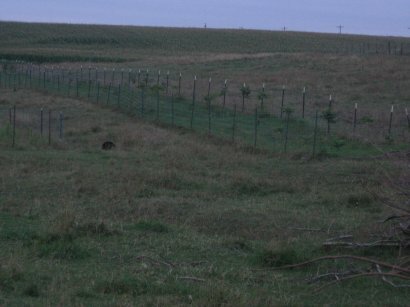 This is the fence along the SE property boundary. Today, the oat buffers along our farm were baled. 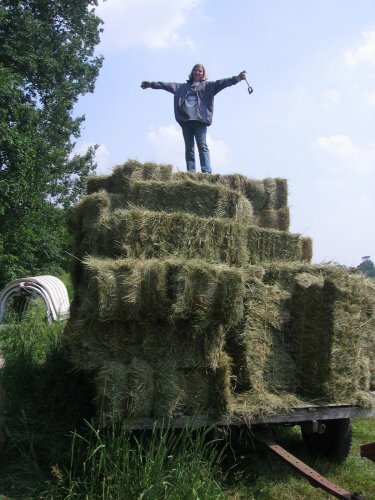 Since all my wagons were occupied and there were only 13 or so bales, we just used the truck to pick them up. We’re looking forward to using this as bedding in the chicken coop in the winter as it will give the hens something good to scratch in the winter. 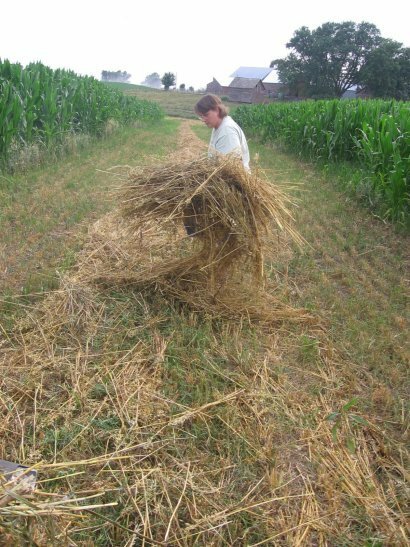 It was good work (it didn’t take long) and there’s something about making hay that is rewarding, no matter how little. 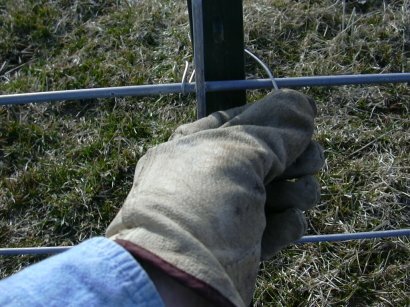 Today was a day for some fencing configuration. 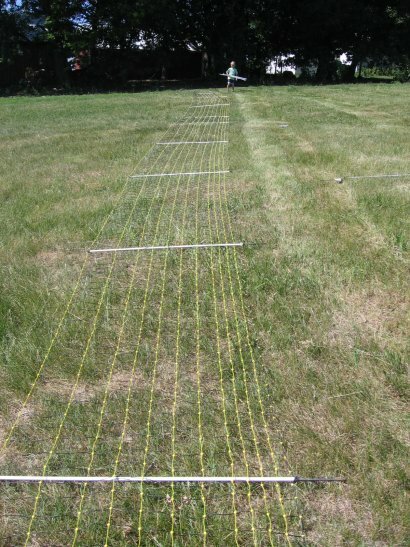 First we put up the portable electric netting fencing. Martin is hauling over the “power posts” for the netting. You can see it is all laid out, the path is mowed, and today’s good fortune was that the 164 foot length was about perfect from the side of the chicken coop to the fence next to the pine trees. It was also close enough to the electric fence in the main pasture to hook onto that instead of putting the solar charger out. 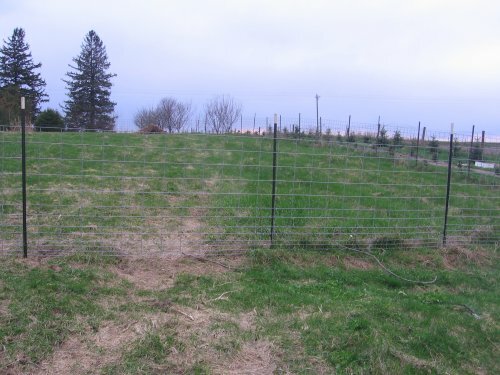 Here’s the fence ready for action – works on chickens and goats alike. Love this stuff. 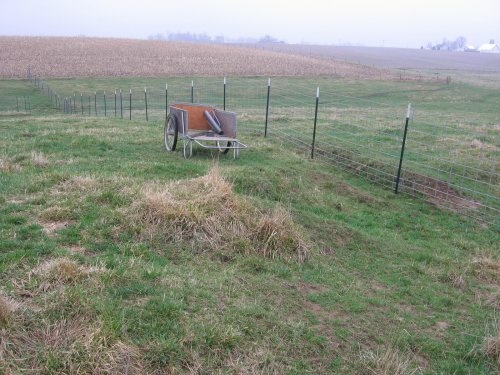 We also took an odd portion of the main pasture and fenced it in with cattle panels to keep the cows out. Thought it was time to put the goats on a different pasture for a while, plus there are some mulberries they’ll mow down first. What more could a guy want than a tractor to do the heavy lifting and a wife to do the pounding! It was nice to have the tractor to save the back by pulling out and putting in posts. 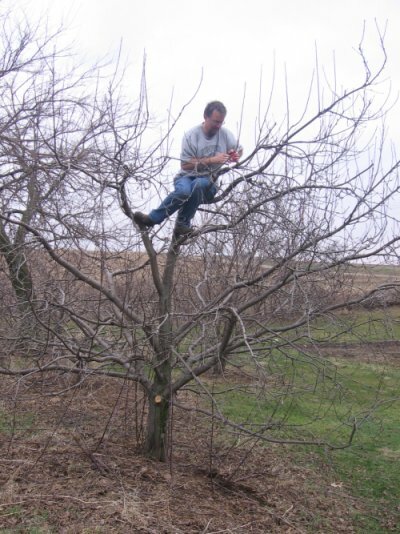 We got a jump on the tree planting planned for tomorrow – brother Kraig down from Twin Cities. 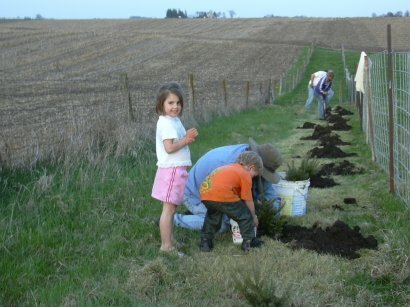 We had many hands tonight working on the northern pine border. 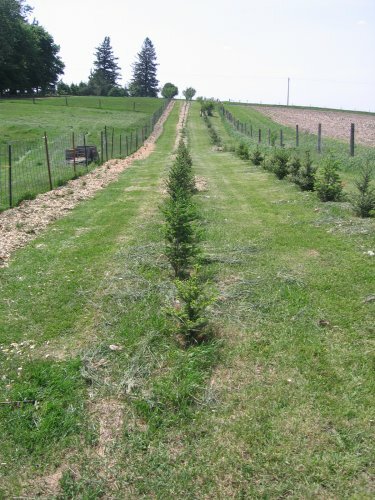 We planted Canaan Fir today, Iowa’s best equivalent of Balsam Fir. Even the smallest hands helped haul water. Rachel and Martin brought us buckets with a gallon or so of water at a time from a stock tank on a trailer. They also helped move carts.